You only can name five varieties of apples? This is not your fault. After all, supermarkets don’t usually go beyond McIntosh and Granny Smith. In reality, the world of apples is actually quite complex — so complex we'd suggest reading our story 10 Things You Didn’t Know About Apples. But if you'd like an apple cheat sheet to get you started, look no further. The first identifier is its deep shade of red. Originally grown in Arkansas (if that isn’t obvious), this juicy fruit is great for long-term storage, but the texture might be way too hard to enjoy. Mid to late October is its prime season. Once widely available, now very rare, the Davis is still grown in Oak Glen, California and Cumberland, Maine. Granular, coarsely textured and mealy. Green and acidic, this apple looks…like no other apple. From September to January, catshead will be ready to eat. Outside of that, it’s much too sour. Smooth and sweet, Discovery awards a firm texture. Under the skin the flesh is pink-tinged, but the color will disappear if put in fridge. As a second generation American apple born in Japan, Fuji’s parents are Red Delicious and Ralls Janet. Now, Fuji is one of the most popular apples in the world — crisp, sweet and super modern. One of the nicest apples around: good to eat fresh or cook. Usually it’s very sweet and has thin skin, so ideal for kids. In-season from October to January. Surprisingly, not related to Red Delicious. It has a long harvest period: through autumn to deep winter. Sweet or acidic; either way, the flesh is always silky. Which apple is in season after Christmas? This one. Sweeter than many green apples, Granny Smith is ripe through spring. Juicy with a strong flavor, the skin feels a little greasy. It has roots in Ireland in the beginning of 19th century, and is now harvested in early to mid August. A new member to the apple family, developed in New Zealand in the 1980s. Dense and crunchy, it has sweet but well-balanced flavor. Very juicy and quite sharp on first bite, but it gets better with time. It has a tough skin like most supermarket apples. But you’ll be lucky to find in a supermarket, as it’s mostly found in Holland. This apple is in season January onward. Its sweetness and crispiness earned it its regal name. This is not a typo. The Lemoen apple does have a lemony acid taste, but it's very pleasant and refreshing. First recorded in 1844 in Bolton, Worcester County, Massachusetts. Creamy white with a green tinge, juicy and sweet. Pink Lady apples are unapologetically sharp, crisp, juicy — everything but subtle. She can be picked from October to November. Its season runs from mid to late September, the texture is soft and air-like; usually the skin’s bitterness is pronounced. Harvested in late September, Rhode Island Greening is on the acidic side. 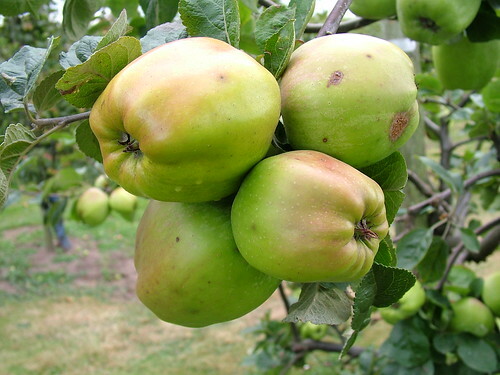 Tender, crisp, juicy and quite tart, similar to Granny Smith. Sweet and good for juice, Spartans can be picked from November to mid-February. You won’t miss the dark red color in the trees. Crisp, green tinge in September, already sweet in September although not ripe. In season from October to December. Probably got this name from the color under the skin: it varies from creamy white to yellow. Very juicy — definitely juicer than bananas — and harvested from December to March.